Now, this wasn't just ANY protest. But a ONE PERSON PROTEST (frankly, the best kind). 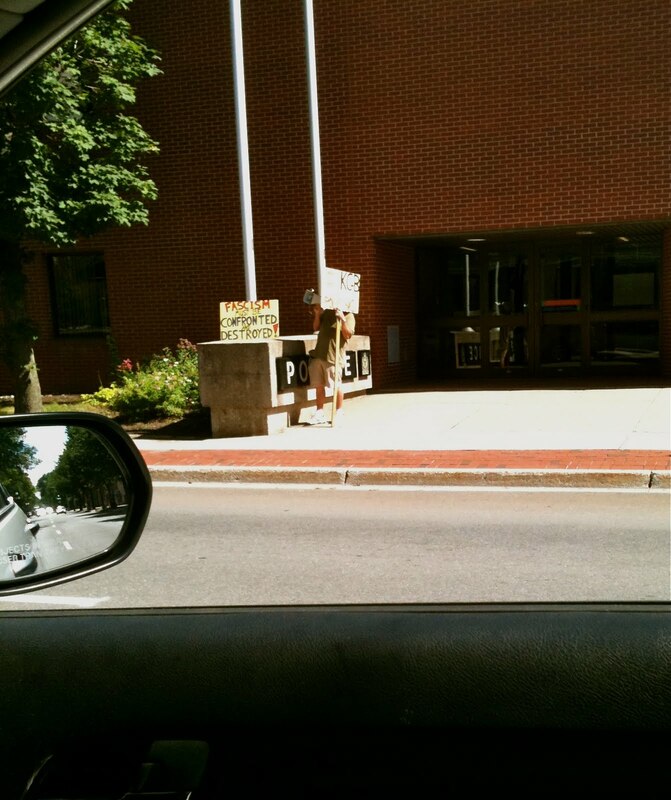 Back in the day, I would've pulled over and had a little chat with the megaphoned dude outside our local police department, but I've learned over the years that those who choose solo-protesting often aren't terribly concerned with personal hygeine. So, instead of chatting, I stayed on the opposite side of the street with my window down to hear what he was unhappy about. Please excuse the horrible picture, but I didn't want to get spotted and 'poke the bear', so to speak. So sign #1 reads: Fascism must be Confronted and Destroyed! Now, after listening for about three minutes, I seriously had no idea what the dude was talking about. Something about Quebec and fascism, but he really didn't explain himself well. I'm not saying that he doesn't have anything to protest, but I think his fascism point is a little off. As are his claims that the Freddy police use KGB practices. I mean, this is the SAME department that's giving away free pizza if they see you pulled over on the side of the road while chatting on your cell. I'm fairly certain that Stalin and Mussolini weren't giving out coupons. Also, if the Fredericton Police Department really WAS using KGB-style policies, I'm pretty sure he wouldn't have been protesting for very long. Still. You've gotta give the guy a little credit. It's freaking HOT outside today.